That would be the most perfect answer I've ever seen in anything. the teacher can't tell if he's offended or not. 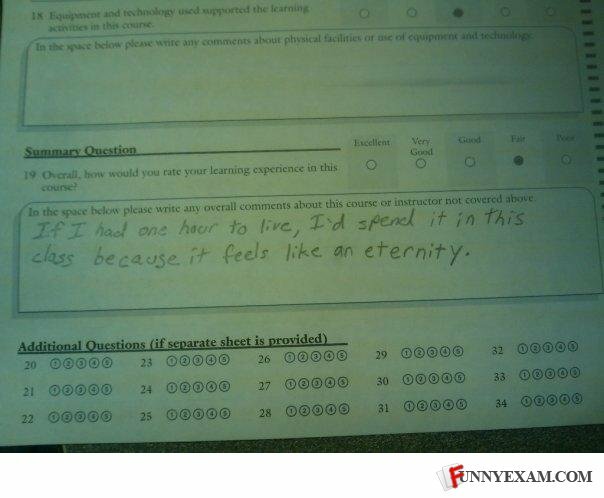 I'm writing that when they hand out the student evaluation forms for my algebra class. Don't talk to anyone time goes by faster!! The essence of truth.. Can be funny as @#$%& !!! You'd spend your last our in class? I'd kill myself early! I couldn't think of a clever comment. OMG I LOVE THIS GUY/GAL me and my best friend r laughing our arses of OKK am soo gonna use that in one my school questionaires am in love. Yet another example of a retard. HAHAHA! This is my girlfriend's from HCC. HAHAHA! This is my girlfriend's from HCC! That's how I feel about class sometimes.